This recipe is part of my arsenal of great, fast recipes that I really like. I frequently get a Bountiful Basket, and when there’s green beans in it, this is most likely the recipe I turn to. I also love that it’s a one-dish meal. I usually just make some rice and serve some cut fruit with it for dinner. It comes from The Best International Recipe (America’s Test Kitchen). In a wok or large skillet, heat oil over high heat until just smoking. 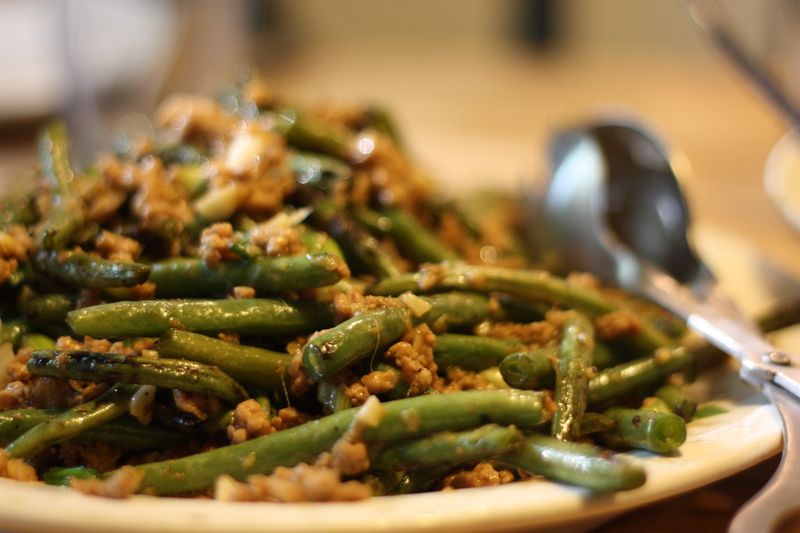 Add the green beans and stir-fry for a few minutes until you they are crisp-tender, and are shriveled and blackened in some spots, about 5-8 minutes (reduce the heat if the beans darken too quickly). Transfer the beans to a large plate. Reduce your heat to medium-high and add ground meat to the pan, breaking the meat into pieces until no pink remains. about 2 minutes. Add the garlic and ginger and cook until fragrant, about 30 seconds. Whisk the sauce to recombine, then add the sauce to the skillet and cook, tossing constantly, until the sauce has thickened, about 30 seconds. Remove the pan from heat, and stir in the scallions and sesame oil, then spoon over the beans and serve with rice. I just tried this using a round grease screen on top of a pot instead of the pot and basket. Look it up online. The advantages include not having to buy and store extra equipment and the rice not sticking to the wire screen. This peanut sauce recipe is truly amazing. Thanks Natalie!